Russian President Vladimir Putin on Friday said Moscow wants to work with other countries to “remove the imbalances in the global economy”. In Vladivostok on Friday, Putin said the GDP of the BRICS countries calculated at the purchasing power parity is greater than that of the G7, the Group of major industrialized nations. “As far as I know, the GDP of BRICS is $37.4 trillion, while that of the G7 is $34.5 trillion. And if we go and say: ‘No, thank you, we are going to do this and that here on our own, and you can do it the way you want it,’ this will only add to the imbalances. If we are really set to resolve some issues, we should do that together,” he told Russian agency Itar Tass. The leaders of the BRICS states (Brazil, Russia, India, China, South Africa) will meet on the sidelines of a G20 summit in Brisbane, Australia this weekend to further boost political and economic ties between the group. On Friday, the Russian President also said Moscow is consciously making a concerted attempt in reducing dollar dependence for Russian trade, pledging that Russia will make greater use of settlements in ruble and yuan in its trade with China. “We’re moving away from the diktat of the market that denominates all commercial oil flows in US dollars. We’re encouraging in every way the use of national currencies – both the ruble and the yuan,” he said on Friday. Earlier in a meeting with his Chinese counterpart Xi Jinping in Beijing this week, Putin said Russia supports China’s efforts to promote the international use of yuan and make it a global reserve currency. “China is one of our key partners in the Asia-Pacific region… We are already carrying out our first deals in ruble and yuan. We are ready to extend such possibilities to trade in the energy sector too,” Putin said. Both Russia and China have stressed that the world financial system is still dominated by the US dollar and is in need of a more diversified mechanism to reduce reliance on a single currency. 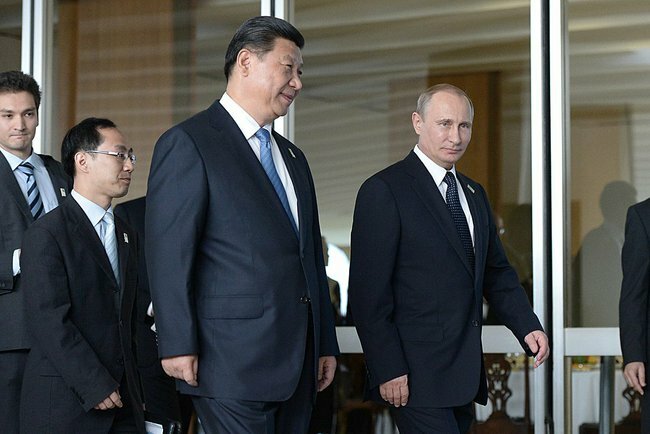 Russia and China have signed 17 agreements on Sunday after Presidents Vladimir Putin and Xi Jinping met in Beijing. Russian state oil giant Rosneft and Chinese oil major CNPC also signed an agreement on Sunday to sell 10 per cent of shares in Rosneft’s subsidiary Vankorneft to China National Oil and Gas Exploration and Development. “But we are also making arrangements on selling oil from that deposit, which is actually huge, for the yuans,” said Putin on Friday referring to the deal. Earlier in September, Moscow and Beijing have entered into a pact to boost use of the rouble and yuan for trade transactions. Earlier this year in the Brazilian city of Fortaleza, BRICS heads of state agreed to establish a $100 billion New Development Bank (NDB) at their summit meeting, with severe implications for the global development-finance landscape. The five countries have also created a $100 billion Contingency Reserve Arrangement (CRA), meant to provide additional liquidity protection to member countries during balance of payments problems. It is fantastic news! The 21st century is certain into establishing the BRIC’s/EuroAsian Council’s dominance,both economic and political,in the world. It has been a long time since the World has needed the banksters’ thugs to be removed from their controlling and steering the world down to the sewage of anarchy. Excellent! The World needs a new order out of the IMF. More justice and socialism. The canabalism & liberalism failed. World needs better system…but good luck if u believe Moscow…..Ask countries that went through that for tens of years. Where they ended up. Putin is oligarch puppet master protecting his establishment not a saviour. How can the GDP of BRICS be 34 Trillion, what data is this based on ? It is more like 16 trillion if you look at the numbers of 2014 ….